It’s another busy day with my man being sick (food poisoning) and a baby who is teething. 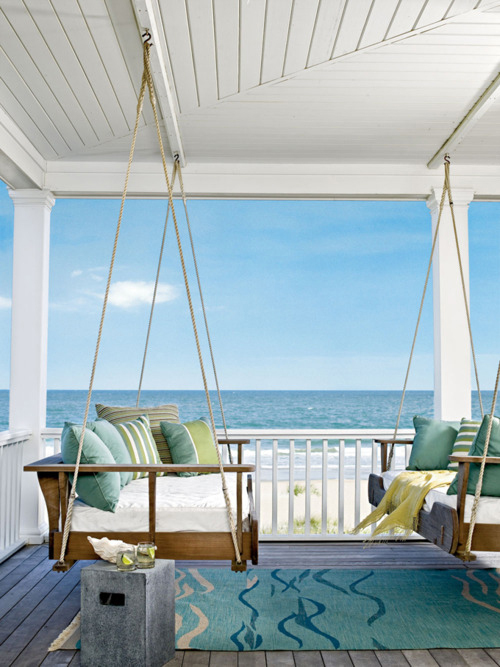 I am dreaming of a quiet moment on this veranda with gorgeous ocean view. Oh no! Hope everyone gets well soon! danielle – not sure if it came from the same source, but here’s another shot of the veranda: http://www.onbluepoolroad.com/2011/04/lust-wish-dream.html – it’s from atlanta homes and lifestyles, so maybe there? Hope your husband gets better soon! C’est super beau et doux. Cela donne envie de se prélasser. wow, that looks so relaxing. give me a book and a mojito and I’m a happy girl. I’ve been taking photos of decks for some articles I’ve written but gosh, I never stopped to think about photos showing the view from a deck or porch. Shame on me as that is one of the points I make about picking the location for your deck, to get the best view. Just found your blog, love it! My baby is teething too, no fun! Happy Friday!